When disasters of scale happen, like the massive 9.0-magnitude earthquake that struck Japan and sent tsunamis rippling across the globe last month, one of our first reactions is to immediately try to establish contact with those we care about who might have been affected. By phone or by email, by whatever means possible, we scramble to get in touch. Of course, natural disasters often wreak havoc on our lines of communication and, with many people simultaneously attempting to reach loved ones, cellular networks quickly become overloaded. I, personally, will never forget the anxiety of struggling to find and reach relatives in Lower Manhattan immediately following the September 11th attacks. Unfortunately, the disaster in Japan was no different. Phone lines were either down or those that were available quickly became overloaded with calls, and many people had to spend anxious hours waiting to find out if loved ones were alive and safe. Yet, while technology sometimes has the tendency to abandon us in moments of need, it is also a tool that reunites us. We learned today that, TekTrak, a mobile tracking and security app, provided one Japanese family with this very ability following the March 11 quake. The family (who asked to remain anonymous) was unable to locate their daughter in the disorder, who was at school over an hour from where they lived — or to reach her on the phone. But, because the app works in the background of a phone’s OS, using the 3 hardware components already built into most smartphones (cellular, GPS, and WiFi) to pinpoint its location, the girl’s parents were able to go onto TekTrak’s website to find their daughter’s location. And, once they saw the timestamps in the app’s location history feature, they knew she was okay, because they could see that she had been moving since the earthquake had struck. The father said that it usually took his daughter an hour to return home by bus from school, but on March 11th, it took more than seven hours. Luckily, the worried parents were able to follow her progress home using the app’s web maps. Originally he uploaded the app on his daughter’s phone, he said, to prevent against theft, as the $5 app both enables users to monitor the location of their device at all times and to secure sensitive or private information stored on the phone. Sometimes it takes a disaster to show us the areas of true weakness within our infrastructures, be they communication, transportation, or electrical — and, on the flip side — they sometimes reveal applications or strengths we didn’t necessarily know we had. Obviously, apps that help us stay connected (and aid in search and location) in the event one method of communication disappears can be extremely valuable in emergency situations. So, if your phone should turn off and you are unable to locate it directly, TekTrak allows you to see where the phone was last located (and check location history). The app also comes with a remote ringer feature that allows users to locate their device once they are within close proximity of the phone. Or, if you don’t think you can retrieve the device from that location, users will soon be able to send remote messages to the phone in the hope the person who may have the phone will respond, founders Arik Waldman and Luka Sklizovic said. Albeit a single case, it is great to see an example of technology not only allowing people to reunite with their phones — but, more importantly — their loved ones. 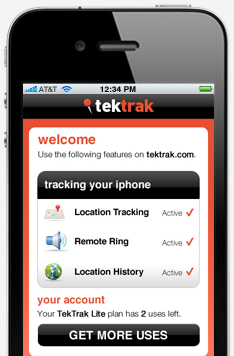 For more info on the story, or the app itself, you can check out TekTrak’s blog here.